At this time we have found the YATE client 4.2.0-2 to not work well enough with OnSIP that we can recommend it as a product. The issue is that the phone indicates that it can support G.711 ULAW and G.711 ALAW but when a call connects using ULAW, the phone will not transmit or decode audio. We tested this using the latest YATE client and calling welcome@junctionnetworks.com. Our system will default to G.711 ULAW when it can, however when called by the YATE client, we experienced dead air. We have contacted YATE to notify them of this development. Here is the list of codecs supported directly from a YATE invite header. Unfortunately at this time the standalone Yate client is not fully compatible with our service. 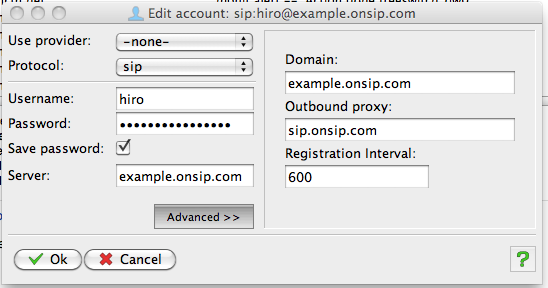 To register a client with OnSIP, we ask that the Authorization Username be independently configurable. The Yate client supplants the authorization user name with the AOR username. This means that only users who have the same authentication and AOR usernames will register with OnSIP. The inability to configure an authentication username is extremely limiting and is effectively incompatible with OnSIP. Allow: ACK, INVITE, BYE, CANCEL, OPTIONS, INFO.